"If you could recommend one book to managers, what would it be and why?" I liked it because it's a complete set of topics and resources and a great starting point to reason about your challenges and responsibilities as an engineering manager; because the narrative includes digressions of real episodes from the professional life of the authors; and because the book percolates the great experience of the authors at every page. Giordano Tamburrelli‏, Development Team Manager, Milan, Italy One of the authors (Ron Lichty) presented on the topic of software engineering management at my employer in 2015. His talk was a great introduction to the book, which I subsequently read. It's an excellent summary of the ins and outs of software engineering management with applicability across many different environments. I recommend it as an introduction to managers new to the field as well as a handy reference for the experienced leader. I am looking forward to future revisions that reflect the ever changing field of software engineering. Alex Bochannek, Sr. Engineering Manager, Ticketfly I just wanted to say thanks for sharing all those experiences through your book, Managing the Unmanageable. I watched the video lessons and think those were amazing!! I have 2.5 years as a delivery manager but without training and the book information opened my eyes to better ways to do the things. I will continue experimenting and adopting your ideas to my team. Thank you Sir!. Juan Carlos Romero, Software Delivery Manager, Zapopan Area, Mexico I am impressed by the quality and amount of information provided in this book. As a HR Manager for a medium sized tech company, I have some knowledge in many of the areas covered, but there were still little gems that were helpful. I will be sharing this with my management team to help them improve the software development process at our company. I don't write many reviews, but I thought well enough of this book to write one. Bruce Bedayan, H.R. Manager, Digital Dynamics The book Managing the Unmanageable is really good. We had two copies in our office but I just bought my own copy and another for a former colleague. Mu Qiao, Engineering Manager, Ticketfly I can't emphasize enough how much I wish I'd read this book as soon as I had been promoted. Or even before. I'd highly recommend this book to any software engineer who has, like myself, been promoted into management. And I would also recommend it to managers from other disciplines that have found themselves managing a software team. This is a must read for anyone managing software developers. David Peterson, Silicon Valley Software Engineering Manager The quintessential management guidebook that should be in the hands of not just software leaders, but anyone managing technology. Michael J. Kimball, stealth startup President Finally a book about managing developers BY developers. I am head of engineering at a start up (and a developer myself) and really needed a read that would reflect my experiences as a developer AND as a manager. I will be getting this book for our library for all new managers at our company to reference. It is so great. Amazon reviewer (5 stars) Managing the Unmanageable would be useful to anyone taking on a management role or to current managers who want to up their game. Easy-to-read and overflowing with real-life examples and in-the-trenches stories, it’s a great combination of how-to and why-to. Adrienne Dale, Consulting Fractional COO I've worked around software engineers for more than a decade, and I'm married to one – and I learned a lot reading this book. I've seen no other book that really dives into the same topics. Pam Fox Rollin, Executive Coach I found this book enjoyable to read and very practical to implement. The authors have broken the art of the software programming process down into easy bite size chunks so even the non-technical managers can absorb it. I recommend this book to all executives with responsibility to either manage or interact with a software development team. William L. Mince, reviewing on Amazon (5 stars) This is one the must-have books for anyone in the management of software development and delivery. It's a collective wisdom of 60+ years experience. The Rules of Thumb and Nuggets of Wisdom section is awesome and I wish I had those 300 nuggets 10 years ago. It’s one of the master pieces for managing software development and took its place near by The Mythical Man-Month in my digital library. Alp Eren Yilmaz, Solution Delivery Manager, Brussels, Belgium Great practical advice about managing software developers. Both Ron and Mickey have built their skills the hard way, through many failures and hard experiences. It's only when you've been through the fire that you can write a book this practical and readable. For those who want very practical hands-on advice about management software people and projects, this is a great place to start. The guidance in Chapter 4 about how to setup a new engineer's first day was incredibly useful, especially as I read it just before we had someone new start. It allowed me to have the smoothest first day ever on-boarding a new employee. But beyond that, ... this book provides lots of great advice to learn how to handle the people management part of software development. Well worth the read! Bruce D. Rosenblum, VP Engineering, CTO and Co-Founder It's so full of lessons I learned the hard way. I'm trading the school of hard knocks for this book! David Etheridge, VP, Program Management, Shutterfly Amazing book. The authors are sharing their deep experience and I think its a must read for anyone remotely connected software management. Valentin, reviewing on Amazon (5 stars) If you're or going to manage programmers, this is your bible! 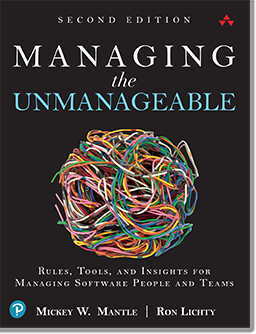 Vernon Baker, 30-year software veteran, reviewing on Amazon (5 stars) I agree with reviewers who equate (not just compare) Managing the Unmanageable with Mythical Man-Month. It is a “modern day classic” that belongs on every Software Manager’s Desk. Chuck Berg, Software Architect and Systems Engineer, SVForum Board Member, .Net SIG Chair I always start with skepticism about business books. Many business books spout one or two interesting ideas, and build up hundreds of pages around the idea to justify the cost of the book. I feared that this book would follow that pattern. When I exhausted my immediate reading list, I saw this near the top, and thought I might as well give it a chance. I'm glad I did. The book is packed with useful material, and every page is worth it. "I recommend that just about anyone in development - either management or developer - get and read a copy. If you're a manager of developers, then this book is directly meant for you. It may include much material you're familiar with, but it codifies it in one place, and puts the ideas in the context of when they might work, and when they won't. It even provides various management "tools" (spreadsheets and word docs) you can download. If nothing else, the "tools" might be useful to compare with what you're already doing. "If you're a developer, this book provides a great framework for you to understand how you fit in a team. This will give you some perspective to understand what your manager is doing, and why (and, for that matter, when your manager is not doing what they should...). And of course, if you're interested in a promotion that involves managing a project, this will be useful material to already understand. Eric Johnson, Principal Architect I read your book, Managing the Unmanageable, with interest. I’ve managed software people through most of my 40-some year career and know the truth of what you speak. Robert Olson, repeat startup Engineering VP who began his career with HP and now mentors startup VPEs A great book for existing Software Managers, that contains lots of valuable "best management practices", good rules of thumb, and new approaches to dealing with familiar obstacles. 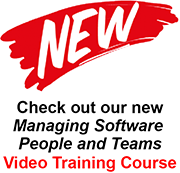 "Most new Software Managers don't receive any management training before being promoted. Yet these new Managers are entrusted with some of the highest value assets that any company "possesses": those "unmanageable" creative, bright, capable, and hard to replace Engineers/Programmers. Software management is not like managing the sales team, or a store, it takes different skills and approaches. The difference between having a team of engineers (programmers) working on the job, and having a focused motivated team "humming" toward the goal, is huge. I especially liked "Managing the Unmanageable's" discussion about the motivation of creative workers -- it provides some great insights. "I ramped up two new Software Managers last year, and wish this book had been available for them at that time. I certainly will buy a copy for the next one. "Mickey Mantle and Ron Lichty have written a new classic. Highly recommended. Steve Podell, Software Engineering Director, Innovative Interfaces I've been managing programmers for several years, and "Managing the Unmanageable" has outstanding advice on how to herd the cats while preserving a sense of teamwork and creativity, and getting things done for customers. Philip K. Robinson, on Amazon Agile has no explicit mention of role transformation and the people managers feel ignored by the gurus.. this book is a must read for all people managers who are managing or want to manage the crucial developers... and turn them into high performing individuals and teams Amazon Customer Practical, well organized, comprehensive. This is the new standard for engineering management. The beating heart of the book is the collection of quotes from managers that makes up the center of the book. The variety of voice, the humor, and the diversity of viewpoints is uncollected anywhere else. Chris Lunt, VP Engineering, Mountain View, CA This is a very low BS, highly actionable description of what it takes to effectively manage a software development team. The text is about the real-world experience of hiring, leading, managing, all the skills required. Daniel Williams, PhD, MCSD, Boulder, CO Very useful (whether you are managing software or depend on a software team to deliver the goods). Michael Weber, reviewing on Amazon (5 stars) This wonderful book by Lichty and Mantle is a breath of fresh air! With practical down-to-earth advice on tactics, motivation, administration, direction, interaction and processes, I would wholeheartedly recommend it to anyone who has become, or who aspires to be, a manager in the software industry. "I can't claim to have cross-discipline management expertise; I've only managed software developers and consultants. But the great thing about this book is that it addresses the specific culture of software development with an insightful and contemporary perspective, accurately capturing the mindset of many developers and explaining how to be most effective within that mindset. "If you understand that high-performance software development is a carefully orchestrated dance between process application and people management, and you want to know how to get the best of both worlds, this is a book you must read. Mark Denne, engineering manager, architect, and author of Software by Numbers I am a college professor who teaches software engineering courses and I think this is a great book for college students. Often, I hear students tell me they don't know what to expect once they land their first software development job. This book sets expectations for what a good organization is, what a competent manager should be doing, and hopefully, how they will eventually lead the organizations of tomorrow. I highly recommend it. Mark Mahoney, Ph.D., Chair, Department of Computer Science, Carthage College Anyone leading a software development team knows the value of having an experienced friend willing to help you. We all want someone we can go to and ask those tough questions about issues we face. "I find myself turning to this book often when I face a tough issue. I ask myself "What would Ron and Mickey say about this issue?" I turn to the index and look for my topic. To be sure, not every question I have is answered. But a lot of them are. It is like having a old friend with a lot of experience there willing to help me. "The topics of the book are well chosen. The depth of the experience of the authors is tremendous. The conversational style of the book is so direct. It wastes no time getting right to the critical points. The organization of the material makes it a good read and an excellent reference book. At the same time, the book is not perfect. There are many major topics that are not covered. And, some topics are so elementary that I wondered why the authors spent so much time there and ignored other major subjects.